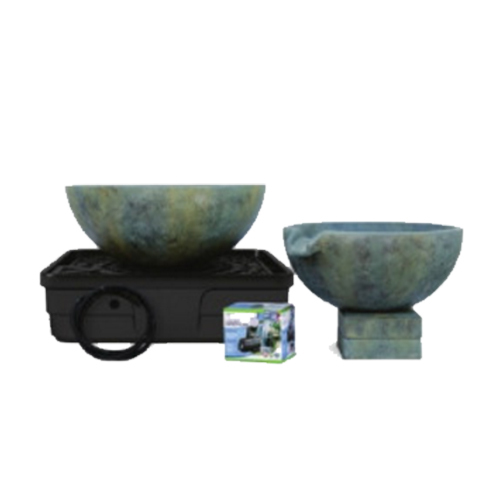 The Aquascape Spillway Bowl and Basin Landscape Fountain Kit bundles the perfect combination of products. The included Spillway Bowl and Spillway Basin are constructed of durable GFRC and display a unique patina finish, providing a long-lasting, elegant, multi-step fountain for any setting. The included AquaBasin 45 is a sub-surface water basin is able to store up to 98 gallons, minimizing maintenance significantly. Constructed of professional-grade high density polyethylene, the basin will provide features and benefits that eliminate guesswork, improve water circulation, and increase accessibility. An extremely energy-efficient Ultra Water Pump is included to circulate the water through the fountain, and the included pipe and fittings makes installation easier than ever.